Inspired by short story "A Very Old Man with Enormous Wings" by Gabriel Garcia Marquez. Use arrows to move. Walk into characters and items to interact with them. Turn your sound on for some atmospheric music. Because of input lag present in the most recent version of Chrome, use Firefox for best experience. This is so tranquil and nice. I like how each feather tells a story. How do you get the one beside the palm tree in the first screen? I haven't been able to figure that one out. I was wondering, how did you get 6 colors at the same time on screen? 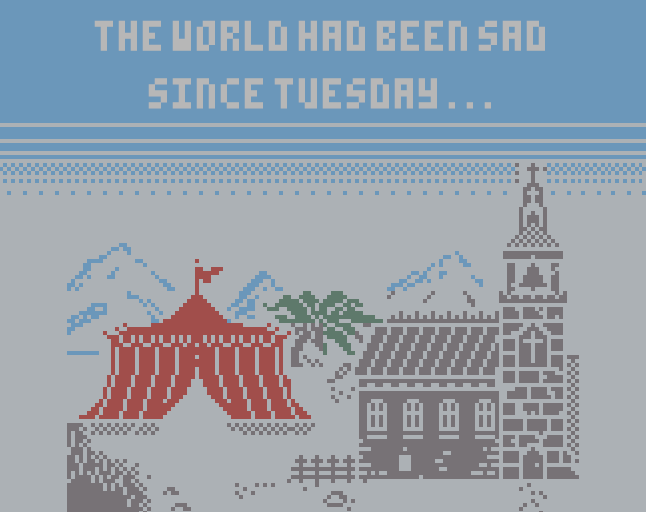 This is one of the best written, best animated, best looking, and best realized Bitsy games I have ever played -- and there are a lot of great ones out there. Amazing and inspiring work! "Nothing here but us chickens!" Amazing game! The visuals and story really do well to evoke that feeling of the surreal. Very captivating game. It made me really want to keep seeing how such a strange event would unfold scene by scene. This was incredible! I've not read this story, but wow. Lovely visuals! Great visuals and great adaptation of the story! Absolutely amazing. The art is great, but the inclusion of the atmospheric music really takes this to another level! While this game is not a direct adaptation, I think it might push someone to check the original story out. 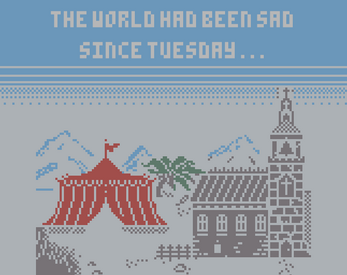 I definitely would like to make some other tiny games inspired by literature in the future. My previous Bitsy game "House of the Living" uses some elements from Poe's "The Facts in the Case of M. Valdemar," but it is far from an adaptation. It is a more generic Gothic story. I haven't read the Lottery, but glancing at the plot it looks like something definitely in my wheelhouse! The art design blows my mind.